I can't remember a better start to a school year! Getting back into the classroom to teach our school's first Web 2.0 class has been a daily highlight. It is so satisfying to help show students how to establish an on-line identity for the purpose of building a Personal Learning Network (PLN) and extending their learning on topics that they are passionate about. Selfishly, I also embarked on this endeavor back into the classroom to learn from my students. Thanks to their great insights, this week has been especially fruitful! First, there is Akash who defined a PLN in one short paragraph in a blog post this week. This is something I have struggled to do in five weeks! He topped that off with a wonderfully honest post on why students cheat in our schools in another post. This post to an article titled American Schools Lax on Cheating from the Washington Post. Then there was Michelle who offered a post on how she feels about "Busy Work" in school. These are just a few of the firsthand examples that have served as a reminder of the powerful addition that our students add to the equation when it comes to discussions that the adults in schools so often struggle with. Clearly a number of the students are starting to hit on one of our two major objectives for this course, establishing an on-line voice. That leads me to the second major objective for the course which is building a PLN. For anyone who has undertaken this exciting task, you know there is nothing better than connecting with other people who share your passion on a particular topic. During the last couple of weeks, my students have started to realize their connectedness as they have made connections with students from Van Meter, Iowa by sharing blog comments. Getting comments on a blog post is exciting, but getting them from students over 1,300 miles away is even better. Topping the blog comment, in my opinion, is the Retweet. For those of you not familiar to Twitter, that is when someone confirms the quality of one of your tweets by sending it on to all of their followers. In the last two days, I have seen a couple of posts by BHS students retweeted! It was a proud moment! 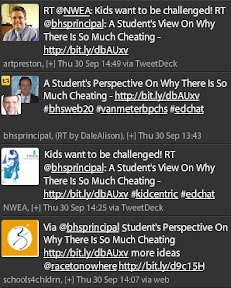 Check out the retweets below where Akash's post on cheating was retweeted by educators from South Africa, Iowa, Oregon, and Arlington. All of this and we are only midway through the first term. Opportunities to make connections with students from Monsignor Bonner & Archbishop Prendergast High School in Philadelphia and Cam High School in Anita, Iowa are available. But in reality, opportunities to connect with learners everywhere are a few keystrokes away. You can set your own course and if you have something important to say, people will respond. That is what a PLN is all about! My PLN has allowed me to connect with passionate educators like Shannon Miller, Van Meter High School's extraordinary library/media specialist, and Bill Brannick, the Principal at Bonner & Archbishop Prendergast High School in Philadelphia. These two have also embarked on a similar journey at their own schools, showing students the power of a PLN and showing the world the power of student connections. Keep checking in at The Student Connect PLN and see what are amazing students are up to. Keep up the great work, Mr. Larkin and crew. I wish that I had this training a few years ago. The students' blogs are set up very professionally. I love reading them and commenting on them as well. Good luck!!! The interesting thing is that most students do have many opinions based on their perspectives that maybe teachers do not see. But if the opinions are ever expressed, it is through a fleeting Facebook update. It is good to see that students are learning how to express themselves through blogging and more importantly, are able to connect with other students and teachers this way. Hopefully, this level of communication will increase and help bring about changes that make the learning atmosphere even better.